The Raffles hotel is architecturally beautiful on a grand scale, and is arguably one of the most prestigious hotels in Singapore. 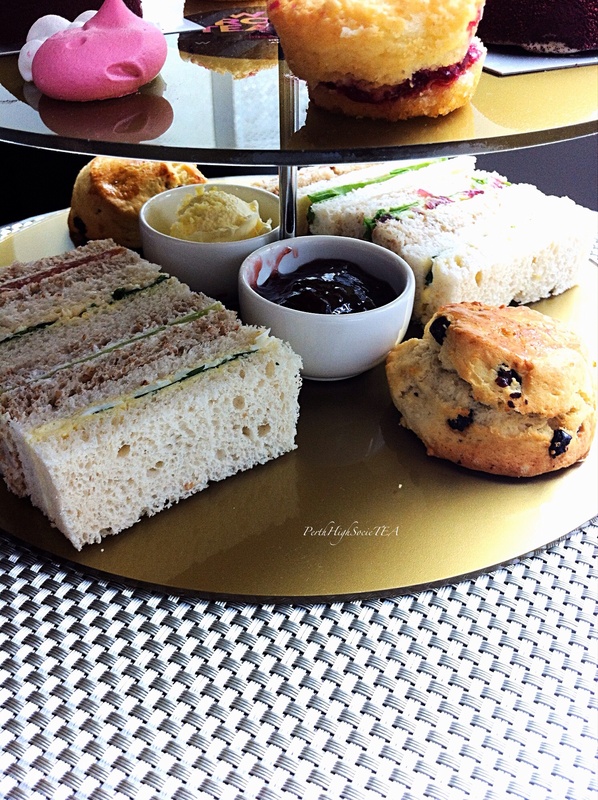 The Raffles Hotel has been serving afternoon tea for more than 100 years. When my fiancé and I arrived, we were directed by a hotel attendant to que outside the Tiffin room- which is located around the corner from the entrance. The line was long, and it was terribly humid and wet. The service was wonderful. Upon arrival, a waiter took our drink orders immediately. I ordered a glass of Champagne and a pot of English Breakfast tea. My fiancé ordered a Singapore Sling and a coffee. The waiter came over again to explain to us the proceedings of the Raffles afternoon tea. The waiter also stated that we could order more food for our three tier stand if we ran out- which I though was very generous. I just love how Singaporeans have a real appreciation for designer bags. When I went to put my Louis Vuitton bag on the floor, a waiter came over promptly with a little stool and popped my bag on to it. Come on Perth, lift your game! Food and beverage service was regular and prompt. Overall, I found the staff to be friendly and obliging. Afternoon tea tea at the Raffles hotel is served semi buffet style. 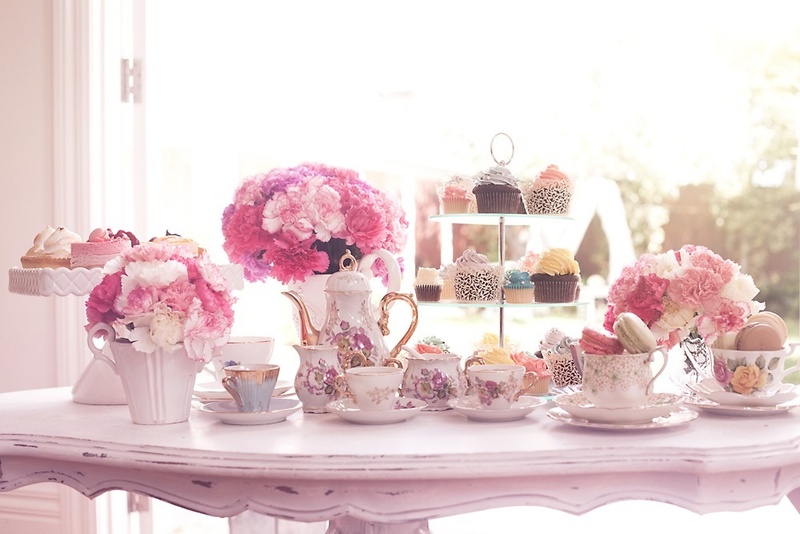 A three tier is presented to each table with a selection of sandwiches and petite desserts. The buffet table features a dim dum selection, and a variety of scones (including one savoury variety), cakes and fresh fruit. The sandwiches and scones were fresh and tasty, however I didn’t particular like the sweets on offer, but that really comes down to personal choice. 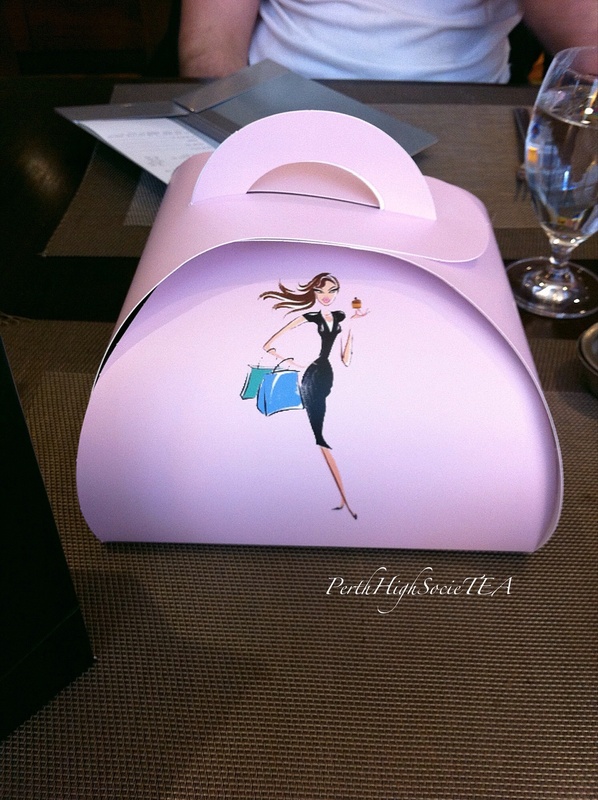 Is it the best afternoon tea I’ve ever had? No. But if you’re a high tea lover like myself, then I recommend that you make a reservation for the Raffles hotel next time you go to Singapore, as it is the most iconic place in Singapore to enjoy afternoon tea. Reservations book up fast, so make sure you book a few months in advance. 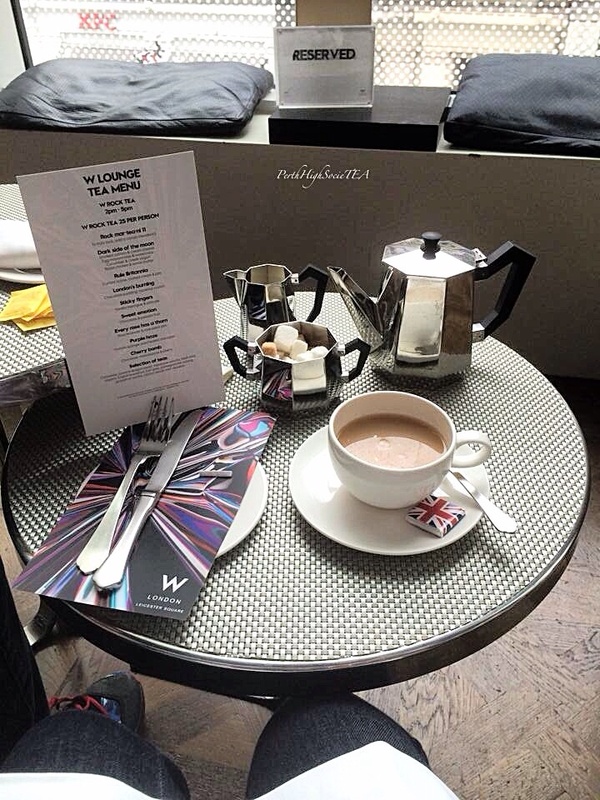 The W Hotel is located in Leicester Square in the heart of the West End. 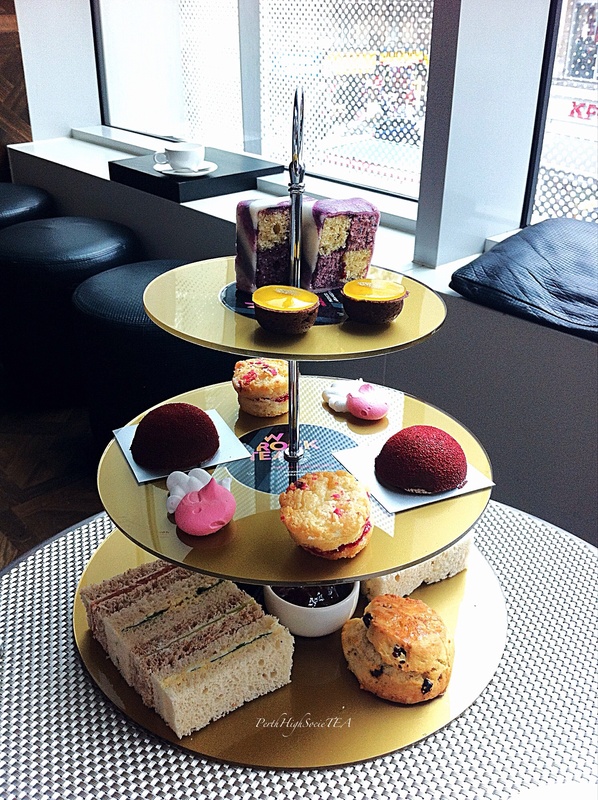 The W Hotel offers an awesome, music inspired afternoon tea. I ended up finding time in our already busy schedule to book this one, because it looked like it would be a lot of fun. The decor in W Hotel lounge is very gentleman friendly. I think it is safe to say that my partner was actually impressed with the look of the venue. I would describe the decor as polished, modern, stylish and with a glam rock inspired charm. 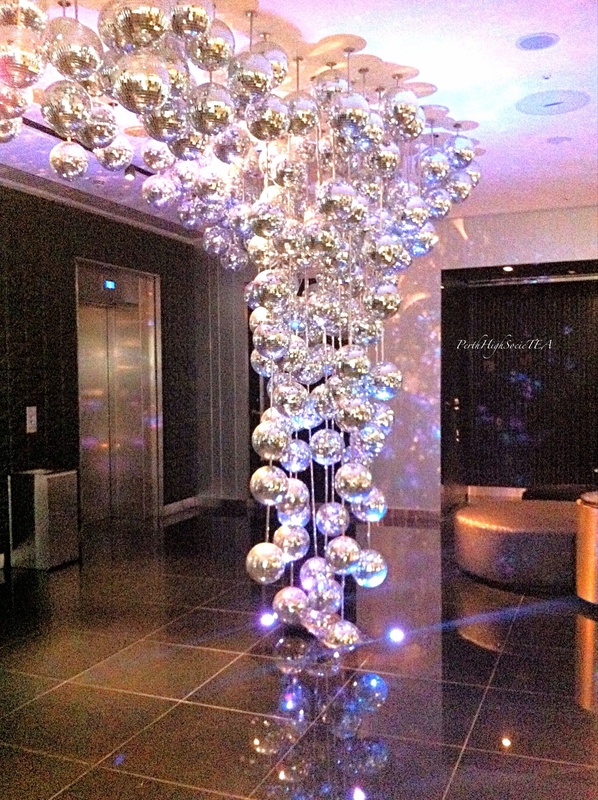 In the foyer of the W lounge, just outside of the elevators, is a mass of incredible looking disco balls. This gorgeous feature really adds a glamorous touch to the entrance of the lounge and bar. 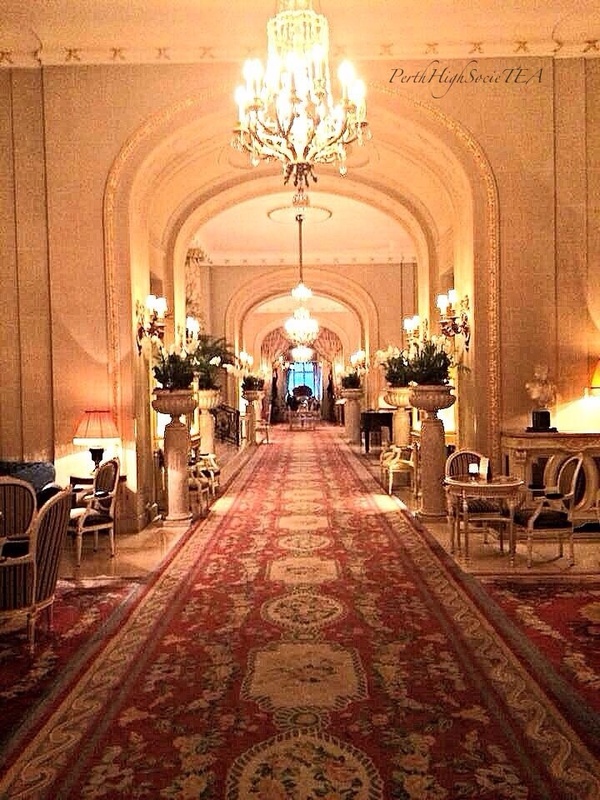 It also ties in nicely with the music inspired theme of the hotel. 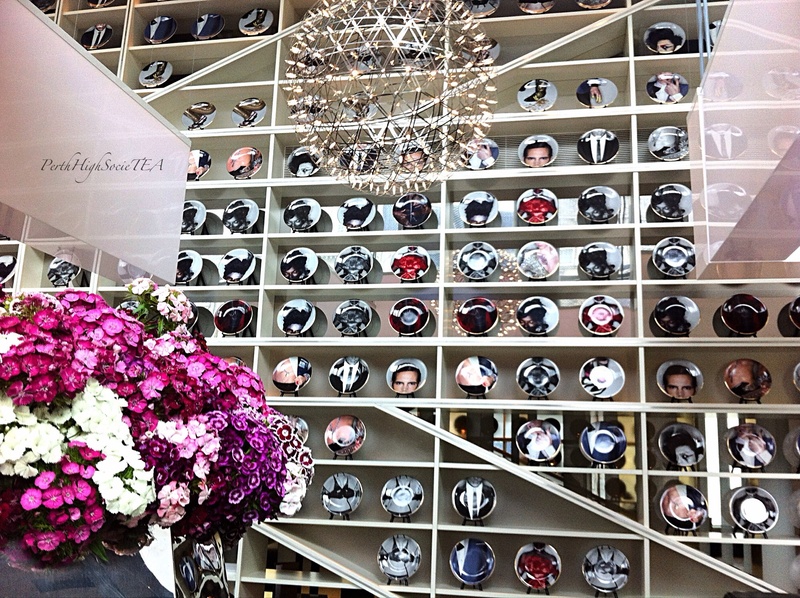 When my partner and I walked through the lounge, we observed the massive wall of collectors plates featuring the images of various famous musicians. Not unlike the disco balls, it gives the lounge area an impressive wow factor. We were escorted to our table in a spacious area in the corner of the restaurant, and facing a window overlooking Leicester Square. We were seated on a big comfortable couch, which was relaxed and fit with the informal theme of the afternoon tea. Our table was adorned with polished silver tea ware and simple white crockery. 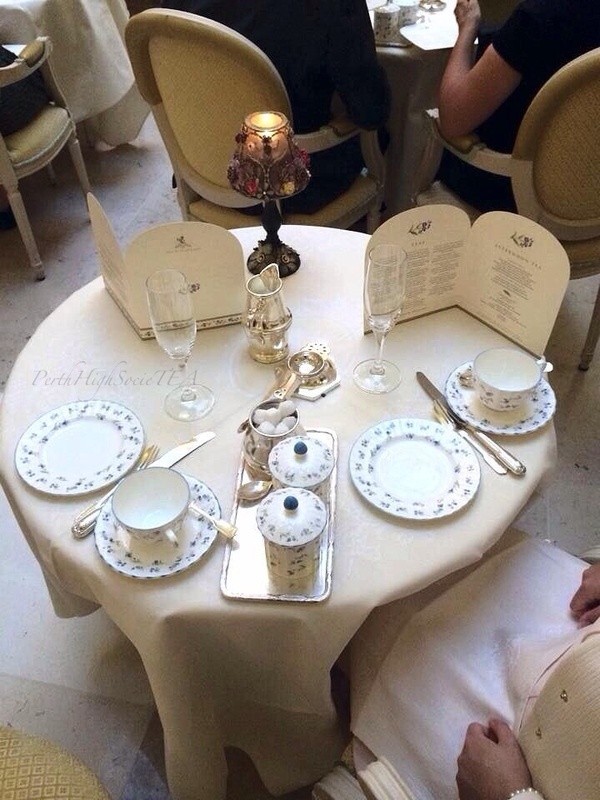 I especially loved the tea pot! The service in the W Hotel lounge was quite good. As soon as we were seated, a hostess took our drinks order and confirmed my dietary requirements. Our hostess was particularly busy, however she managed to stop by regularly to ask if we were enjoying everything, and to see if we needed anything else. Both my partner and I felt that the service we received was both prompt and friendly. For drinks, I ordered my usual pot of English breakfast tea, and my partner ordered his usual coffee. Our food arrived promptly after we received our beverages. Our hostess explained to us that each item on the three tier stand is inspired by a famous song. 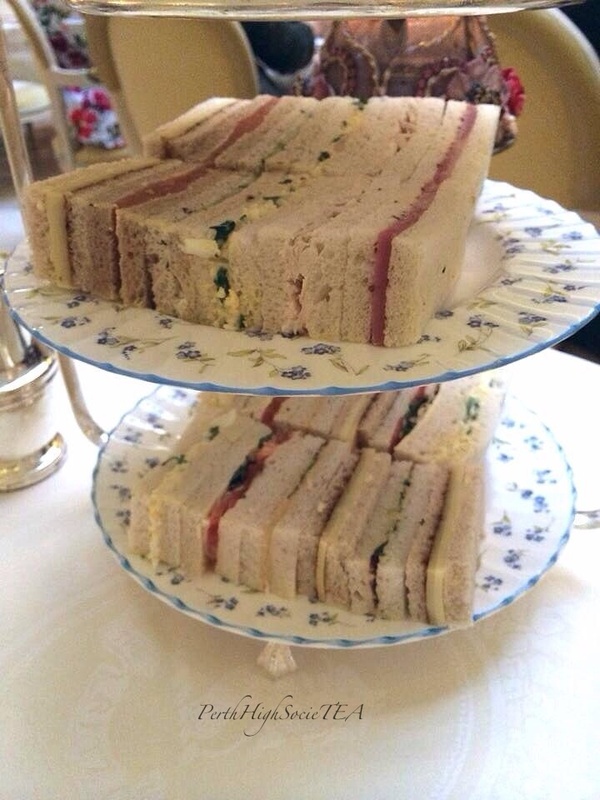 Of course, as always, we started with the finger sandwiches and the scones. The hostess recommended that we begin with the scones, as they were fresh out of the oven. My partner started eating his ‘Rule Britannia’ scones first, and I tucked into the ‘Dark Side of the Moon’ inspired sandwiches. My vegetarian sandwich fillings included: egg mayonnaise, red peppers and mushroom, cheese, tomato and lettuce, and avocado and sweet onion. My partners standard selection included: egg mayonnaise, smoked salmon and cream cheese, cucumber and Greek yogurt and roast chicken and lemon butter. The sandwiches were tasty, however the bread was a little on the dry side. 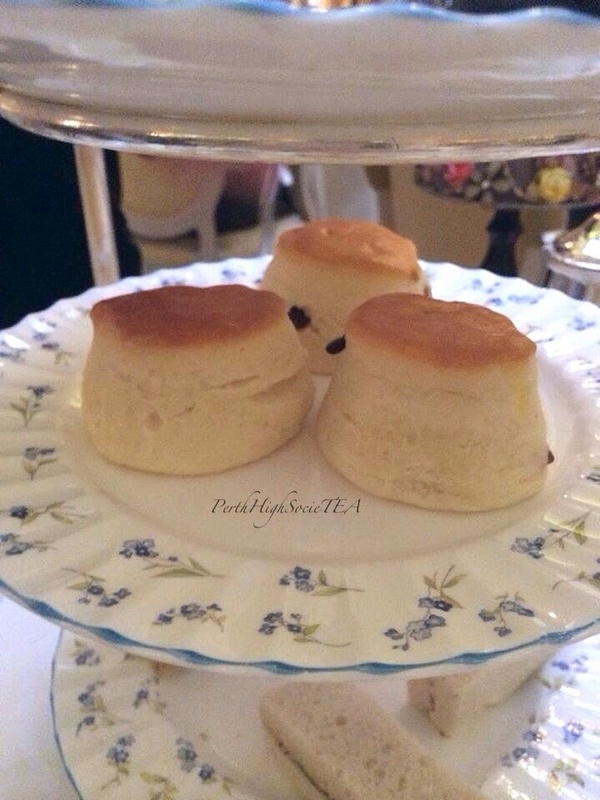 The scones were warm and buttery, and were filled with raisins. Not as fluffy as how I usually prefer my scones to be, however they did taste delicious with the strawberry jam and clotted cream. I must admit, the sweets were what I was looking forward to the most. One glance at the menu, and my taste buds went into overdrive. Plus I thought it was really cool how each individual piece was inspired by a song title. ‘Sticky Fingers’ described as vanilla meringue with attitude. ‘Sweet Emotion’ a delicate chocolate sweet with a strong taste of passion fruit. ‘Every Rose Has A Thorn’ was a rose flavoured fancier with rose petal jam on the inside. ‘Purple Haze’ was a purple and white sponge with marzipan icing. Not a fan of marzipan, so I didn’t particularly enjoy this one. My favourite was the ‘Cherry Bomb’, chocolate and cherry with a strong hint of mascarpone, and dome shaped in appearance. My other favourite was the ‘London’s Burning’ mousse, a decadent chocolate pudding with a hazelnut crunch. 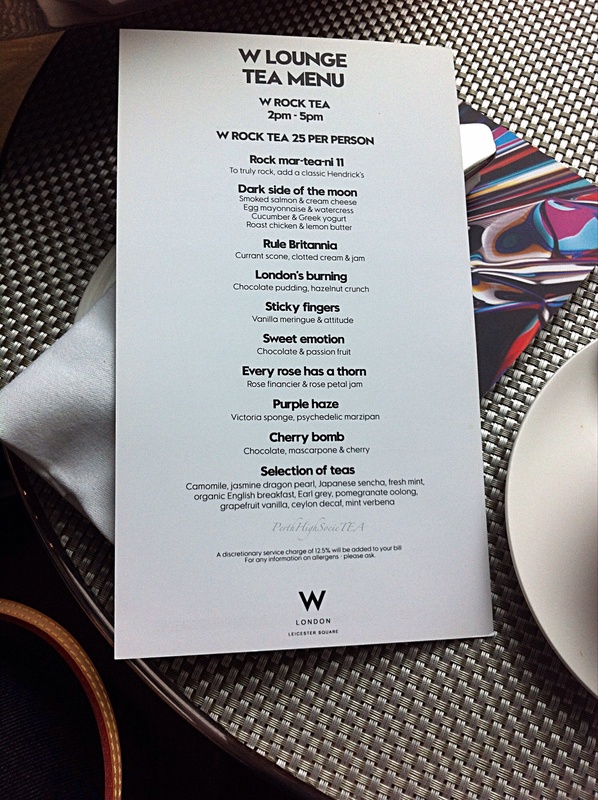 Overall, my partner and I enjoyed our rock inspired afternoon tea at W Hotel. 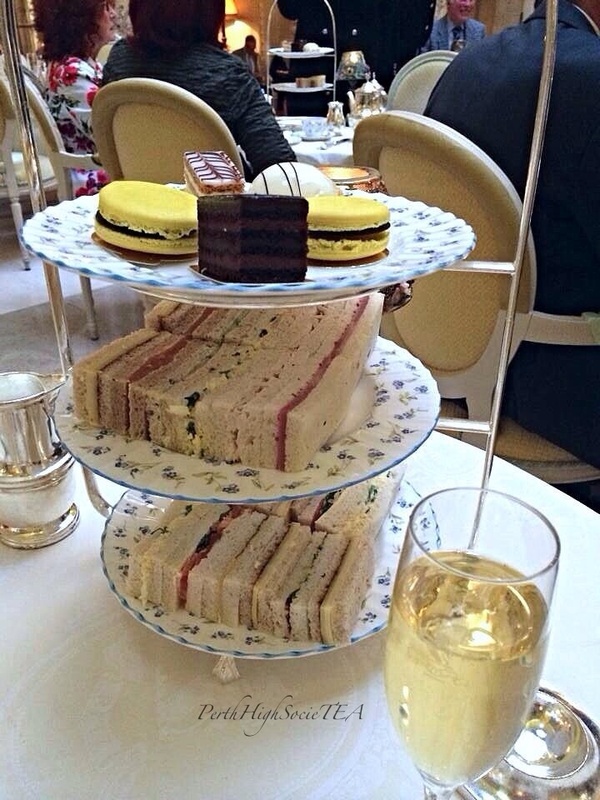 I left London bound for Australia that evening, so it was a great way to wrap up my afternoon tea experiences in London. The ambience of the lounge was nice, and there was a pleasant odour coming from the bar area. There was soft music playing in the background, which to my surprise wasn’t from the rock genre! The venue is spacious and there is plenty of room for patrons. 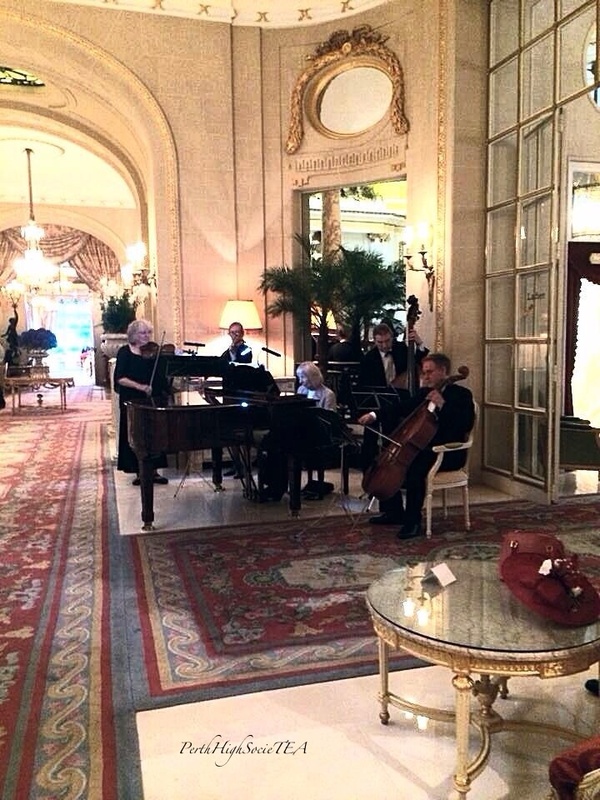 I really liked the music inspired venue, I thought the food was delicious, and we received friendly service. W Hotel is definitely worth a visit if you’re in Leicester Square, especially if you have male company! 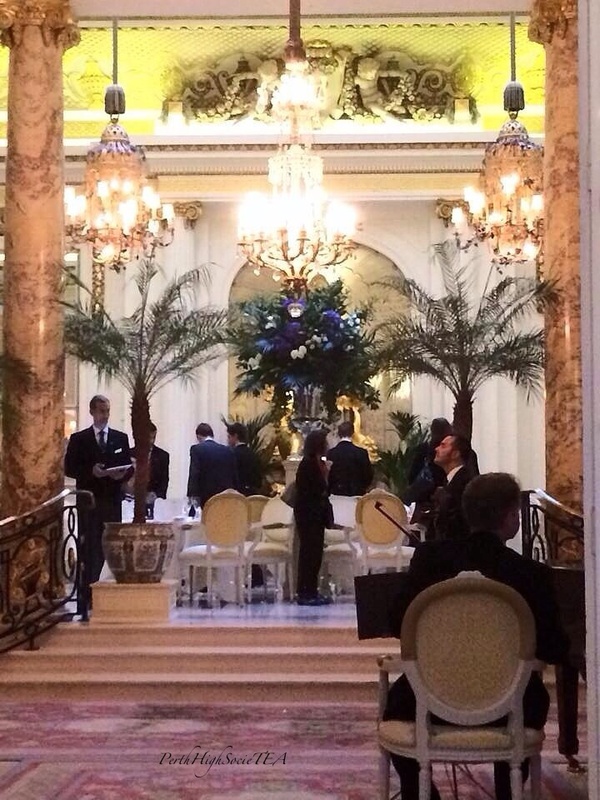 Afternoon Tea is served daily, between 2pm and 5pm. Add £10 for a Hendrix Gin Martini. Please note that a discretionary service charge of 12.5% is added to the bill. Address: 10 Wardour St Leicester Square, London. 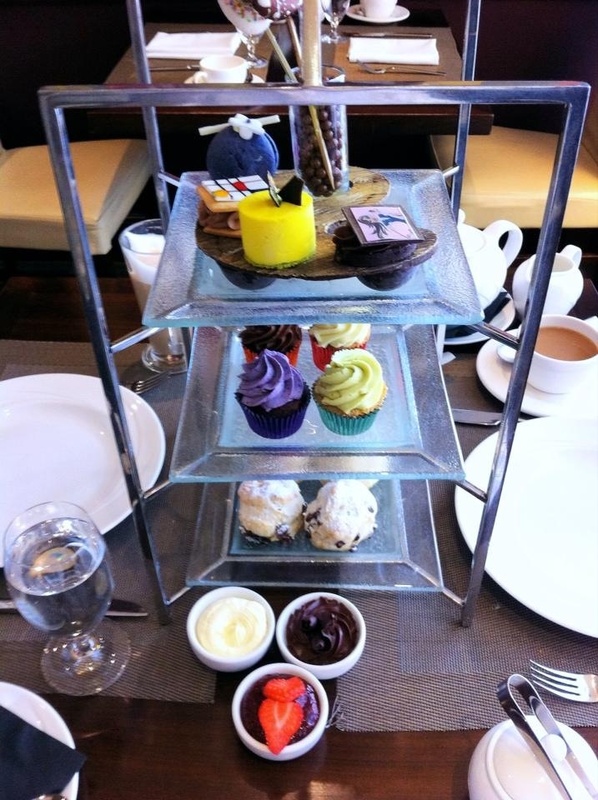 Afternoon Tea at London Hilton Park Lane was one of the afternoon teas that I looked forward to the most. 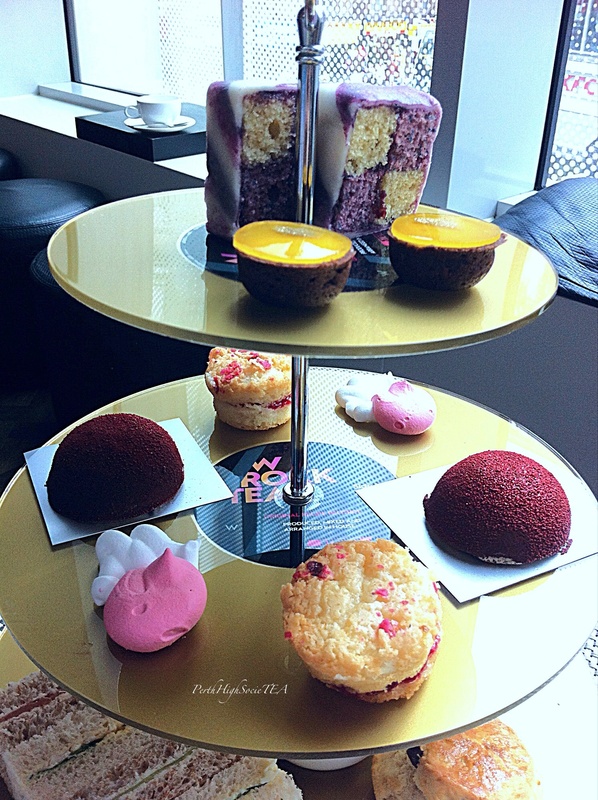 If you look up afternoon tea photos from the London Hilton Park lane you will notice how incredibly delicious, colourful and fun it looks. 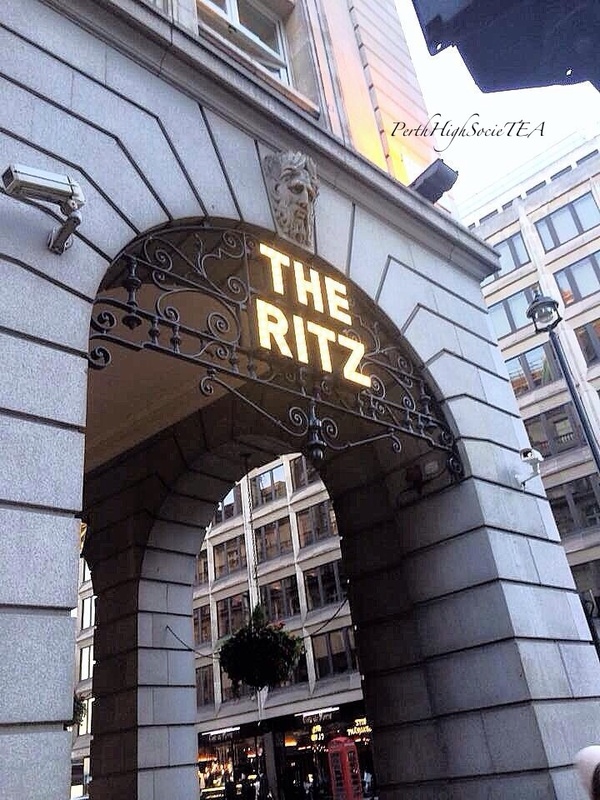 The hotel overlooks the lush green scenery of Hyde Park, is nestled in the heart of Mayfair, and is only a short distance from Buckingham Palace. 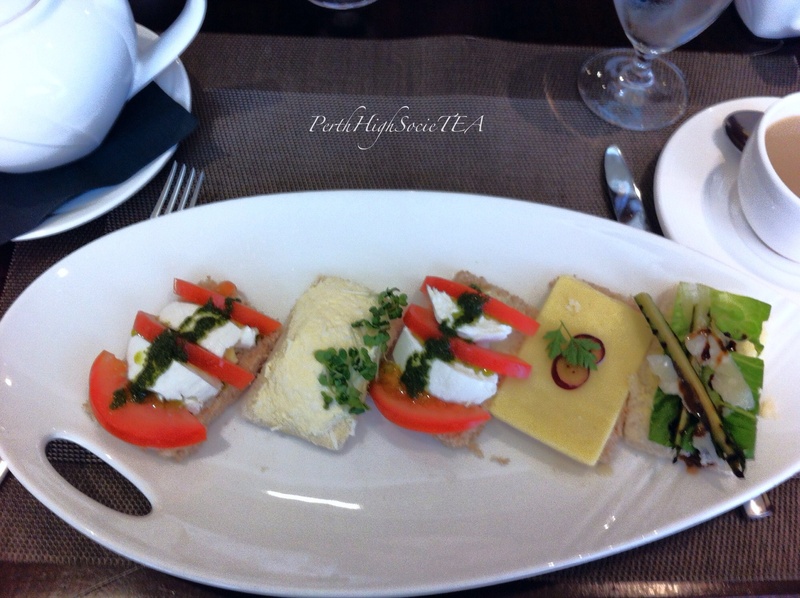 Afternoon tea is held in the Podium bar and restaurant, which is located just inside the lobby area of the hotel. The decor of the restaurant is quite elegant. The restaurant has a beautiful high decorative ceiling, the lighting is soft and subtle, and the furnishings include beige leather seats and polished wooden tables. 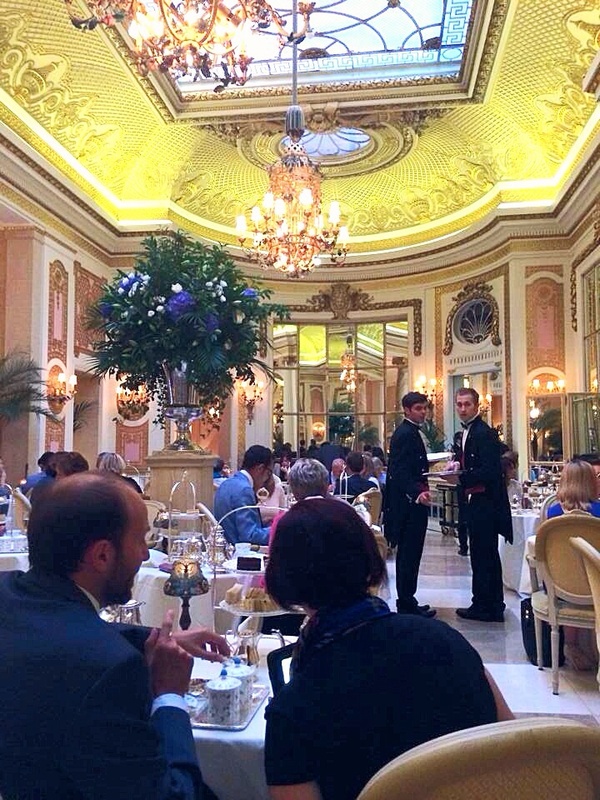 We were seated towards the back of the restaurant, at a window table overlooking Hyde Park. Our table was dressed in a simple manner: white tea ware and napkins, silver cutlery, and taupe coloured place mats. The service was totally faultless. Our hostess was very obliging and she attended to our every need. When we were seated, she kindly explained the menu to us, took our drink orders and double checked my dietary requirements. She even asked us if we were happy with the sandwich varieties on offer, or whether we wanted different fillings. 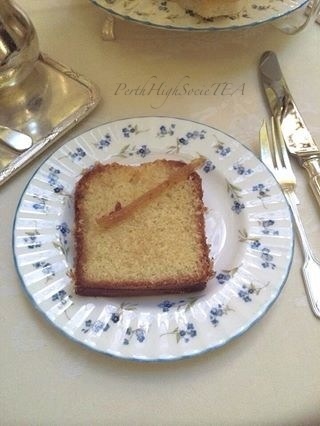 That was a first for me, and I though that our hostess went above and beyond what is expected of traditional afternoon tea service. We were made to feel welcome, and this is something that I feel doesn’t happen as frequently as it should in hospitality. My partner and I never had to wait for anything and the service was always so prompt. We didn’t have a problem trying to get the attention of our hostess either. I’m going to start off by mentioning that my partner and I skipped breakfast that morning. Our high tea reservation was for 1pm, so as you can imagine, we were feeling fairly hungry by that time of the day. We were given an ample amount of food. In fact, our hostess even asked us if we wanted more sandwiches, and then asked us if we wanted more scones. I can assure you that by the end of our sitting we felt as though we were in a food coma! 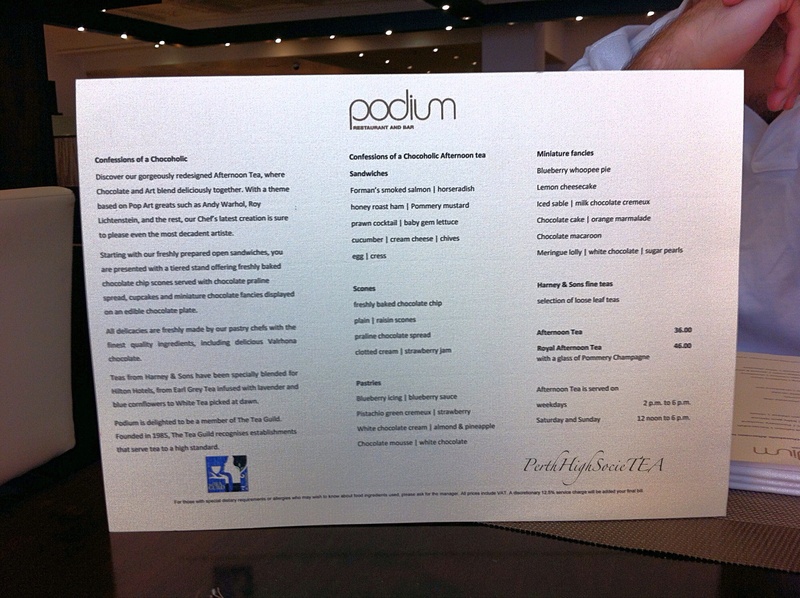 The Podium bar and restaurant is currently offering The Confessions of a Chocoholic Afternoon Tea, and that’s the one we selected… Wow, where do I start? For drinks, I ordered the Hilton Royal English Blend, while my partner ordered a Latte. He also remarked that it was the best coffee that he has had so far in the UK. 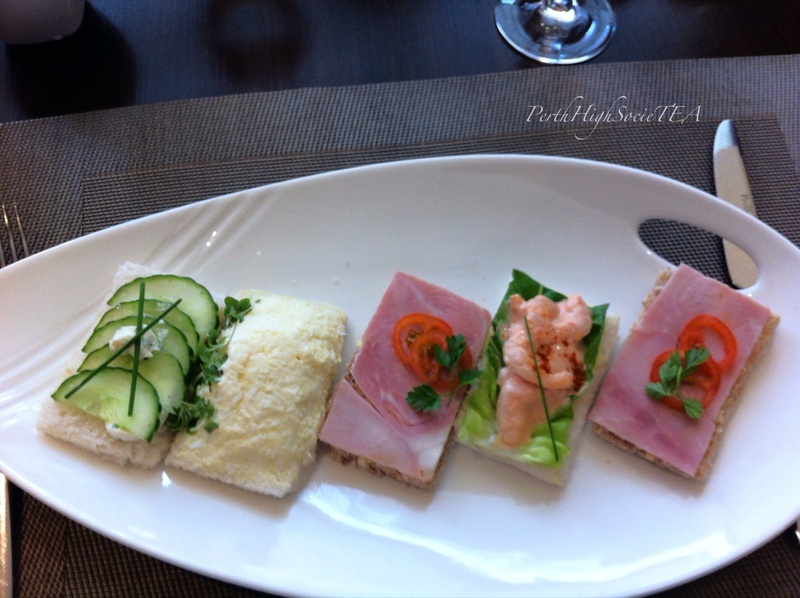 The open sandwiches were the first to arrive. I am pleased to report that they were both fresh and delicious. The non-vegetarian toppings included: smoked salmon and horseradish, honey roast ham and mustard, prawn cocktail and lettuce, cucumber and cream cheese, and egg with cress. While my vegetarian toppings included: mozzarella and tomato, and egg with cress. The scones arrived on the three tier stand, and let me tell you, they were absolutely incredible! We received a selection of chocolate chip, raisin, and plain scones. 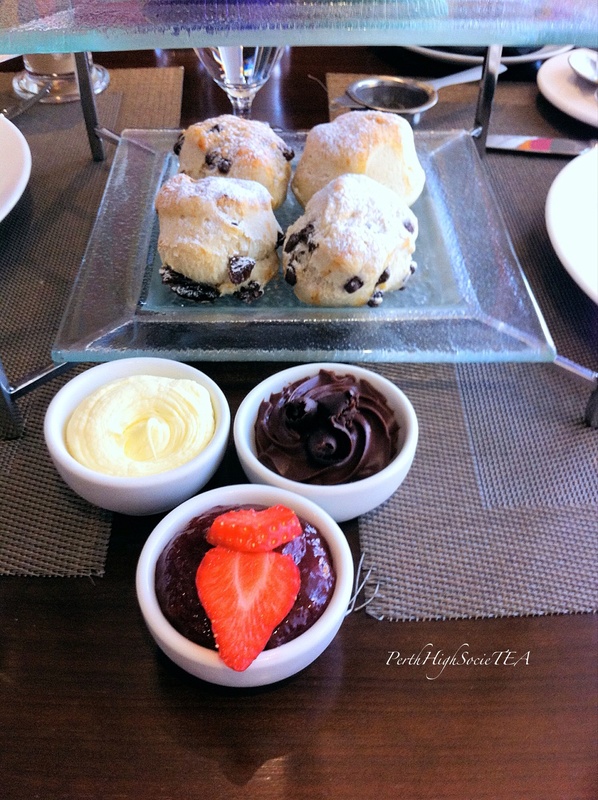 They were warm, fresh, soft, light and fluffy- the perfect scones. The chocolate chip scones were a real treat, and because they were warm, when you cut it open, the chocolate chips had started to melt. The result was simply heavenly. The accompaniments included clotted cream, strawberry jam and an amazing praline chocolate spread. Usually, after eating scones I always struggle with the ability to eat anything else. 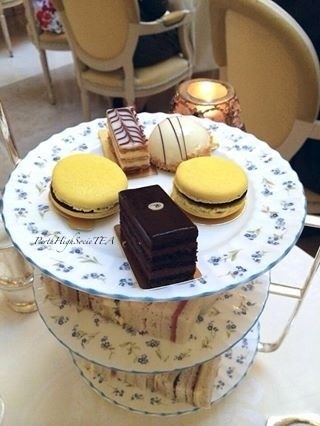 However, with this particular afternoon tea, I knew that I just needed to persevere, pace myself, and at least attempt to eat some of the tantalising looking sweets that were staring at me on the top tier. 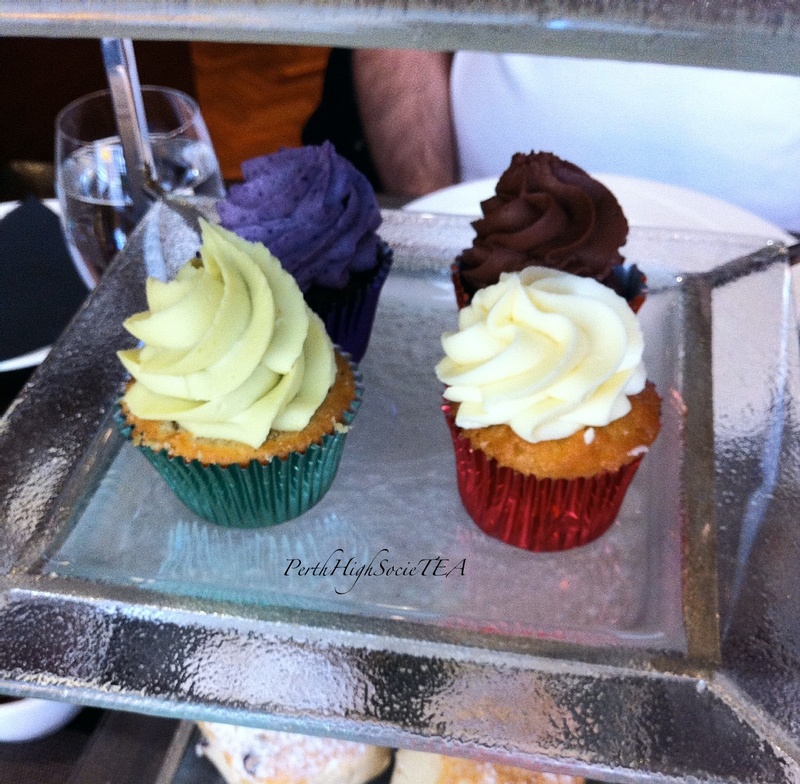 On offer was a tier of petite cupcakes: blueberry, white chocolate, chocolate mousse and pistachio. The white chocolate cupcake was the star of the show. It was the most delicious cupcake I have ever tasted in my life! The cupcakes were all so decadent and moist, and were an absolute delight. The Most Amazing Cupcakes I’ve Ever Tasted! The top tier consisted of the ultimate chocoholic’s delight! 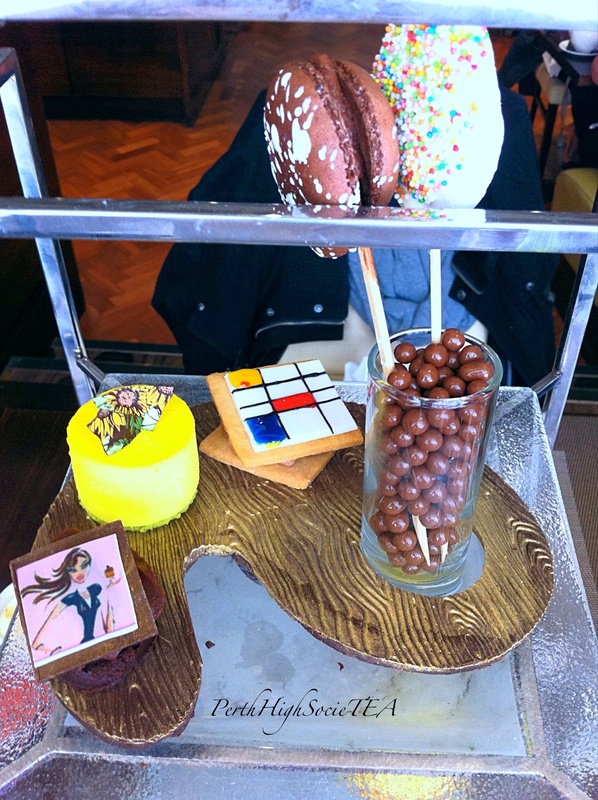 Even the board with the sweets on it was made from chocolate! The sweets included a blueberry whoopee pie, a lemon cheesecake, a chocolate macaron, a really cute meringue lolly pop covered in sprinkles, an iced biscuit with a milk chocolate cremeux filling and a chocolate cake with a gorgeous decorative chocolate on top. I honestly couldn’t fault any of it, as it was all too delightful. Of course, there was no way that we could eat it all. Our hostess offered us this beautiful take home box for our left over goodies. 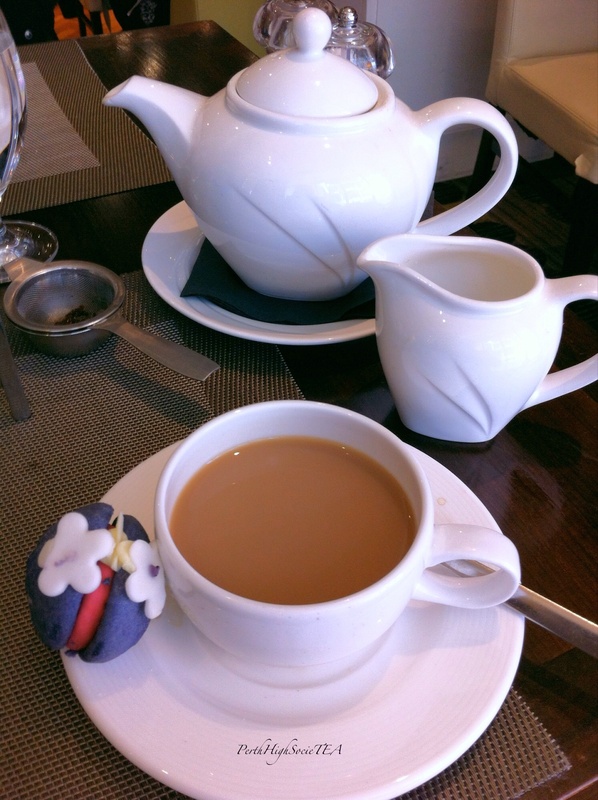 My overall experience of afternoon tea at London Hilton Park Lane was wonderful and I absolutely recommend it. The ambience was both pleasant and very relaxing. There was soft music playing in the background, and we managed to get in before the lunch rush, so it neither busy nor noisy. The venue, the service and the food was all impeccable and totally faultless. 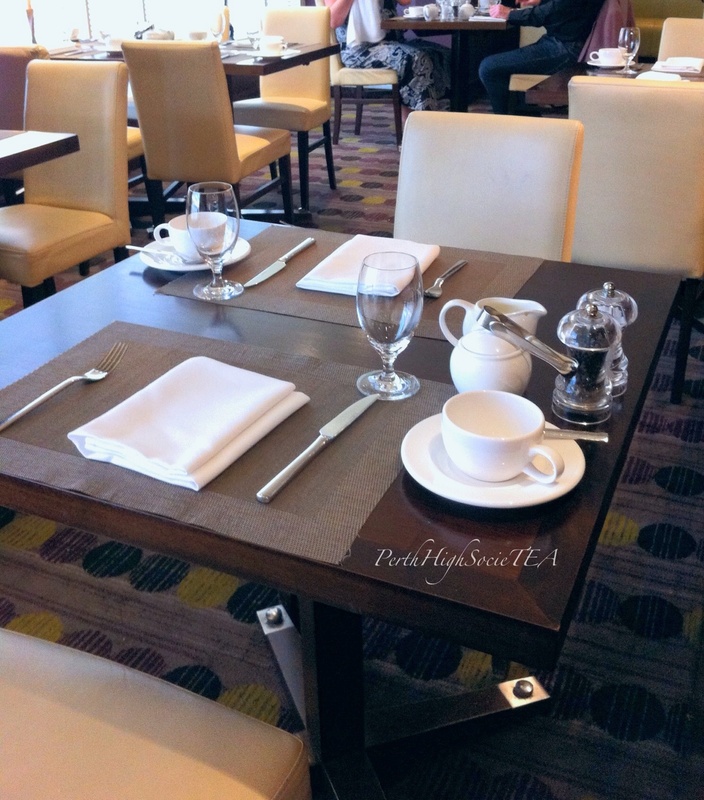 I had such a lovely experience here, and if I ever make another trip to London I will definitely be returning to London Hilton Park Lane for afternoon tea. 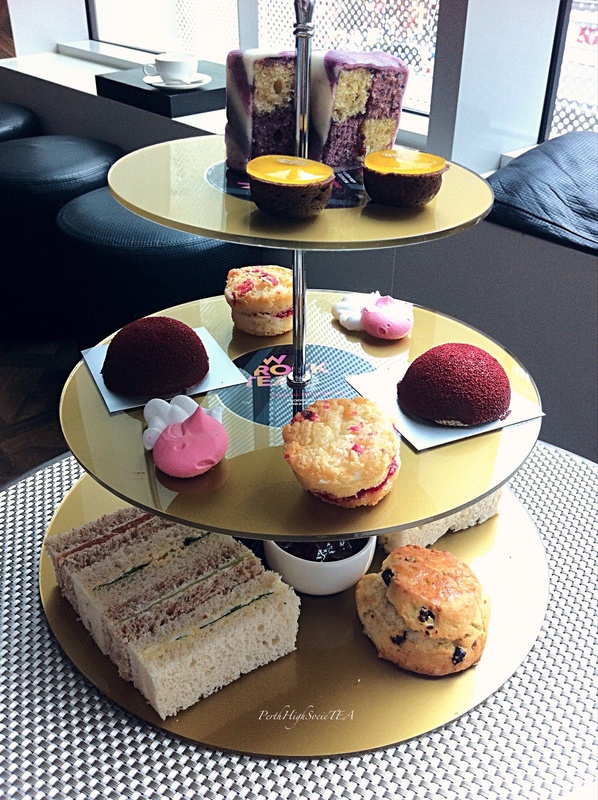 Afternoon Tea is served Monday to Friday from 2pm to 6pm, and on Saturday and Sunday from 12pm to 7pm. A discretionary service charge of 12.5% will also be added to the bill.